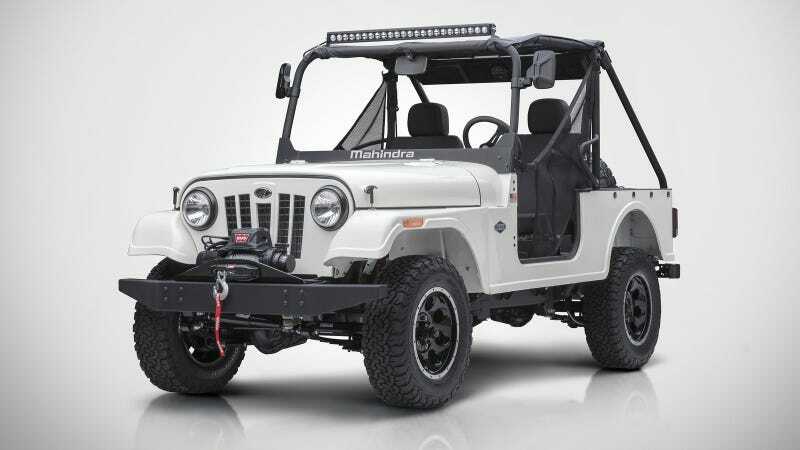 Indian automaker Mahindra just unveiled a new off-road vehicle called the Roxor, and it not only looks like an original Willys Jeep, but it’s also got the hardware (and the history) to back it up. Better yet: it’s for sale in America and it was built right here in Detroit. Unlike many other side-by-sides, the Roxor will feature a very CJ-7-ish steel body mounted on a steel frame. And like an old-school Willys Jeep, bolted to the frame will be two sets of leaf springs holding up two solid axles (3.73 ratio; lockers will be available later, according to company reps). The powertrain will be the ultimate off-roader’s dream: a turbo-diesel (a four-cylinder) mounted to a five-speed manual (an automatic option will also be available) mounted to a low-range transfer case. Admittedly, that 2.5-liter diesel that has to carry around 3,035 pounds of curb weight isn’t the strongest at 62 HP at 3,200 RPM and 144 lb-ft at 1,400 rpm. Mahindra has quite a history of building Jeep-like vehicles, with their very first offering being the forefather of the current Thar (on which the Roxor is based); that first car was essentially a Willys CJ-2A Jeep shipped to India as a knock-down kit and assembled under license back in the late 1940s. It’s these “grandfathered” licenses that allow the company to build such Jeep-like vehicles. And my god, is the Roxor Jeep-like. The rounded fenders are pure CJ-7, as is the door opening with a filleted corner and a sharp 90-degree cut rearward to the top of the rear tub. The shape of the hood, the hood latches, the outline of the grille—it’s all extremely CJ-7-ish. The rear is a bit different, though, with different lights and a fuel filler on the side instead of under the taillamp. The wheelbase is about three inches longer than a CJ-7, overall width is narrower, height is about eight inches taller, but length is almost exactly the same. Unlike the Thar whose bones it shares, the Roxor will not be built in India. It’s being manufactured in metro Detroit, where the vehicle was designed and engineered. There’s no mention of when the side-by-side will hit the market, with the press release simply stating that there’s a National Dealer Meeting scheduled later this month to “discuss the roll-out,” and that the target is to have 300 “[first] wave” dealers. According to chairman Anand Mahindra, the new Roxor will come with an absurd 900 color options. Towing capacity is about 3,490 pounds, and rear payload capacity is only 349 pounds. Maximum speed is limited to 45 MPH—that’s a similar top speed to that of an old Willys CJ-2A. Fuel economy, Mahindra claims, is somewhere around 32 MPG based on company testing. Starting prices for the two trim levels, according to company representatives, will range from $15,549 to $18,999. I can’t wait to get my hands on one.